3Department of Physics, Philipps-University Marburg, Germany. The description of many-particle systems becomes significantly simplified if stable configurations of subsets of the particles can be identified, particularly when the particles are interacting with one another. Examples of stable configurations range from solar systems and galaxies on an astronomical scale  to atoms and nuclei on a microscopic scale . In solid-state systems , the stable configurations are referred to as “quasiparticles” that have several particle-like features, even though their physical properties are influenced by the interactions. The dropleton is the latest addition to the “periodic table” of quasiparticles in solids, as reported in our recent publication . Extended crystalline solids typically contain more than 1020 interacting electrons per cm3, which makes the quantum many-body problem unsolvable based on overwhelming dimensionality. Therefore, finding quasiparticles is not only extremely useful but also instrumental in order to describe and understand the physics of solids. The “crystal electron’’ – or “Bloch electron’’ – is the simplest quasiparticle of solids. One can attribute a varying mass to an electron inside a crystal, in the same way as a swimmer’s bodyweight seems to change in water. As a quantum feature, crystal electron's effective mass not only depends on the electron-crystal interaction but also on its velocity . When a single electron is removed from an ensemble of many electrons, the missing electron is also a quasiparticle called the “hole’’. The hole simply has the properties of the missing electron, such as a positive elementary charge and a negative effective mass. Conceptually, a hole resembles a bubble, i.e. particle vacancy, in water; its motion is clearly much simpler to track than that of remaining particles. The quantum mechanically allowed electron-energy regions in solids are commonly known as energy bands and they can be separated by forbidden regions, the band gaps . Without any doping and at low temperatures, a semiconductor is an insulator where all energetically low-lying bands are fully occupied by electrons and all energetically higher bands are completely free. The absorption of light transfers semiconductor electrons from the energetically highest fully occupied band – the valence band – into the originally unoccupied conduction band. Due to their opposite charge, the optically excited conduction-band electron and the simultaneously generated valence-band hole experience an attractive Coulomb interaction which may bind them to a new quasiparticle known as an exciton [5,6]. An exciton is similar in many ways to a hydrogen atom; however, it has a relatively short lifetime since the electron can return from the conduction into the valence band. In this electron-hole recombination process, the excess energy can be emitted as light or it can be transferred to the host crystal as heat. Under suitable conditions, two excitons can bind into a molecule referred to as biexciton[7,8] which has strong analogies to the hydrogen molecule. Generally, it is an interesting open question if and in which form electron-hole pairs can form even larger clusters with quasiparticle character and how these clusters can be identified spectroscopically. One may distinguish the presence of distinct quasiparticles by the different color resonance they absorb or emit light [9-15], in the same way as atoms and molecules have distinct resonances in the absorption spectrum as fingerprints that provide a positive identification of the “culprit”. However, identification of semiconductor quasiparticles from light absorption is not as simple as it seems. In general, an ordinary laser pulse only induces electron-hole-pair excitations whereas the more complex quasiparticles are created by the quantum mechanical many-particle interactions, yielding several possible outcomes  that blur the quasiparticle resonances. 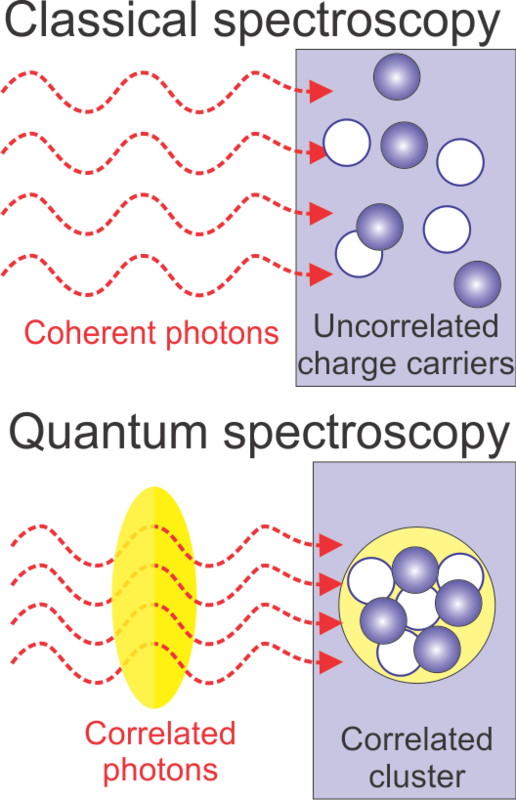 Since the state and the characteristic features of the excited state are very complex and depend sensitively on the detailed excitation conditions, it is generally very difficult to identify the quasiparticle signatures in spectra as long as “only” classical spectroscopy is used. Figure 1: Classical vs. quantum-optical spectroscopy. In classical spectroscopy (left), the photons (wave symbols) are uncorrelated and they create unbound pairs of electrons (spheres) and holes (open circles). In quantum spectroscopy (right), the photons are correlated (yellow ellipse) such that they directly excite a correlated electron-hole cluster (yellow circle). To overcome this problem, we developed the concept of quantum-optical spectroscopy [16,17] based on fundamental quantum properties of light. In general, quantized light can be described in terms of photons, i.e. the energy quanta of light. Whereas classical laser light basically contains isolated photons, i.e. no specific photon clusters, such clusters are characteristic for quantum light sources. Most important for our quasiparticle search, the cluster characteristics of the exciting light is directly transferred to the optically generated electron-hole excitations. Consequently, suitable quantum-light sources can e.g. generate predominantly excitons, or biexcitons, or even larger clusters [16,17]. In other words, one can directly excite new quasiparticles with a quantum-light source whose photon clusters match the cluster characteristics of the desired quasiparticle state. Figure 1 illustrates this main difference of classical and quantum-optical laser spectroscopy. Even though freely adjustable quantum-light sources do not yet exist, we have demonstrated  that a large set of classical pump-probe spectra can be robustly projected into the desired quantum-optical spectra. To collect the data, we used short pulses to generate electrons and holes faster than they can decay. In our quasiparticle-search experiments , we actually apply pulses of light, produced by a laser, that are only 100 femtoseconds (1fs=10-15s) in duration. To study the types of quasiparticles that can occur in a semiconductor, beyond just electrons, holes and excitons, we use a strong pulse, known as the “pump” pulse to excite a desired number of electrons and holes. We then monitor how a weak subsequent pulse, known as the “probe” pulse, is absorbed. To observe different types of quasiparticles, we perform these measurements very carefully as we slowly increase the intensity of the pump pulse. Then each pump-pulse intensity labels a probe-absorption spectrum within the massive set of raw data that is the input to the projected quantum-optical spectrum. When we did this experiment, we noticed already in the raw data that the light began to be absorbed at a new color as the intensity of the pump pulse increased. This new color was distinct from the color corresponding to the creation of an exciton, or of unbound pairs of electrons and holes. We initially ascribed this observation to the formation of a biexciton. However, increasing the intensity of the pump caused this new absorption feature to change color, but very surprisingly, it did so in the wrong direction, namely opposite to the shift of the absorption due to the exciton. This gave us the hint that the new quasiparticles could be dormant underneath the blurred and shifted “biexciton” resonance. Figure 2: Revealing new energy resonances of Dropletons. Dropleton's binding energy is determined from the light absorption that is sensitive to three-photon correlations. 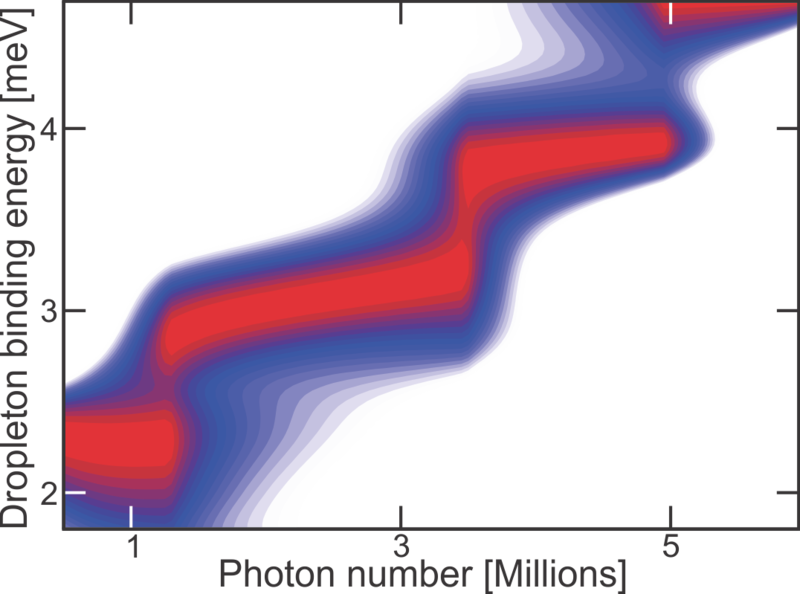 The spectra are plotted as a function of pump pulse's photon number. The red color denotes regions with high absorption. To reveal which quasiparticle explains this curious behavior, we projected the raw data to an absorption spectrum that is sensitive to three-photon clusters; the quantum-optical absorption spectra are shown Fig. 2 as function of pump power. The energy is expressed in terms of binding energy with respect to exciton resonance. For low photon numbers, we observed only a biexciton resonance that had a fixed binding energy around 2.2meV, as intuitively expected. By increasing the number of photons in the pump pulse, we surprisingly observed that the semiconductor starts to absorb light at completely new colors identified by the steps. We also performed measurements that could reject molecular electron-hole states as an explanation for energy quantization, and demonstrated that the new quasiparticle evolves coherently living up to 25 picoseconds (1ps=10-12s) . After discovering these new energy resonances, we proceeded to identify the exact form of the new quasiparticle that matches the measured “fingerprints”. Since the quasiparticle has a stronger binding than biexciton it must contain more electron-hole pairs than biexciton, i.e. two. However, there is no quantum theory that can exactly solve the corresponding many-body problem. Therefore, we had to develop a new approach to identify the new quasiparticles. More specifically, we expressed the system energy exactly in terms of pairwise electron-hole correlation function, instead of electron and hole densities that is the basis of the density functional theory . Since the correlations uniquely define complicated quasiparticles, we could precisely determine the energies of different possible electron-hole configurations. Figure 3: Illustration of a dropleton. In a dropleton, the probability distribution of the electrons and holes forms a ring-like pattern; a representative pair-correlation function is shown as a function of the electron-hole separation. 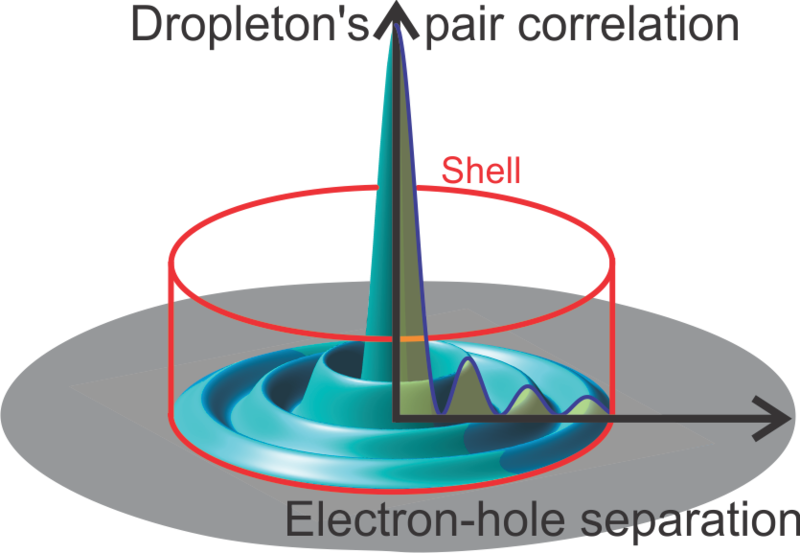 The shell defines the size of the dropleton; roughly one electron-hole pair resides within each ring. After a thorough search, all experimental observations were explained  only by a configuration where electrons and holes are not bound into excitons, but they rather are loosely organized, much like particles in a liquid. However, the liquid was confined inside a small bubble, which directly explained the quantization as a confinement effect. Due to liquid characteristics, quantization, and small size, we called the new quasiparticle a dropleton. The jumps in the dropleton energy levels were shown  to correspond to adding a new electron-hole pair to the dropleton. In total, we could detect dropletons with four, five, six, and seven electron-hole pairs and conclude that the quantum droplet size was in the range of 200nm (1nm=10-9m) in diameter. The discovery of dropleton is the first tangible demonstration that the quantum-optical spectroscopy excites and controls quasiparticles with unprecedented accuracy. To make full use of this encouraging advancement, it will be an important future goal to develop ultrafast and strong light sources whose quantum fluctuations can be freely adjusted. Since the dropletons are brand new addition to the quasiparticle family, it is not predictable how and when they can be seen in practical use. However, all quasiparticles also influence the operation of optoelectronic devices such as laser diodes which are already used in DVD readers/writers and in optical communications. Thus, the improved control of quasiparticles will certainly enhance our ability to design these types of devices. In addition, dropletons couple strongly with quantum light, which should be extremely useful when designing lasers and devices capable of encoding and processing quantum information. This level of control of light-matter interaction will provide intriguing possibilities to test foundations of quantum mechanics as well as introduce new ways to utilize them to build devices with an incredible performance. Jack J. Lissauer, "Chaotic motion in the solar system", Reviews of Modern Physics, 71, 835 (1999). Abstract. Yu. Ts. Oganessian, A. V. Yeremin, A. G. Popeko, S. L. Bogomolov, G. V. Buklanov, M. L. Chelnokov, V. I. Chepigin, B. N. Gikal, V. A. Gorshkov, G. G. Gulbekian, M. G. Itkis, A. P. Kabachenko, A. Yu. Lavrentev, O. N. Malyshev, J. Rohac, R. N. Sagaidak, S. Hofmann, S. Saro, G. Giardina, K. Morita "Synthesis of nuclei of the superheavy element 114 in reactions induced by 48Ca". Nature, 400, 242 (1999). Abstract. Charles Kittel, "Introduction to solid state physics" (Wiley & Sons, 8th Ed., 2005). A.E. Almand-Hunter, H. Li, S.T. Cundiff, M. Mootz, M. Kira, S.W. Koch, "Quantum droplets of electrons and holes". Nature, 506, 471 (2014). Abstract. J. Frenkel, "On the transformation of light into heat in solids. I". Physical Review, 37, 17 (1931). Abstract. Gregory H. Wannier, "The structure of electronic excitation levels in insulating crystals". Physical Review, 52, 191 (1937). Abstract. Murray A. Lampert, "Mobile and immobile effective-mass complexes in nonmetallic solids". Physical Review Letters, 1, 450 (1958). Abstract. J.R. Haynes, "Experimental observation of the excitonic molecule". Physical Review Letters, 17, 860 (1966). Abstract. A.G. Steele, W.G. McMullan, and M.L.W. Thewalt, "Discovery of polyexcitons". Physical Review Letters, 59, 2899 (1987). Abstract. Daniel B. Turner, Keith A. Nelson, "Coherent measurements of high-order electronic correlations in quantum wells". Nature, 466, 1089 (2010). Abstract. Carson D. Jeffries, "Electron–hole condensation in semiconductors". Science 189, 955 (1975). Abstract. Takeshi Suzuki, Ryo Shimano, "Time-resolved formation of excitons and electron–hole droplets in Si studied using terahertz spectroscopy". Physical Review Letters, 103, 057401 (2009). Abstract. R.A. Kaindl, M.A. Carnahan, D. Hagele, R. Lovenich, D.S. Chemla, "Ultrafast terahertz probes of transient conducting and insulating phases in an electron–hole gas". Nature, 423, 734 (2003). Abstract. 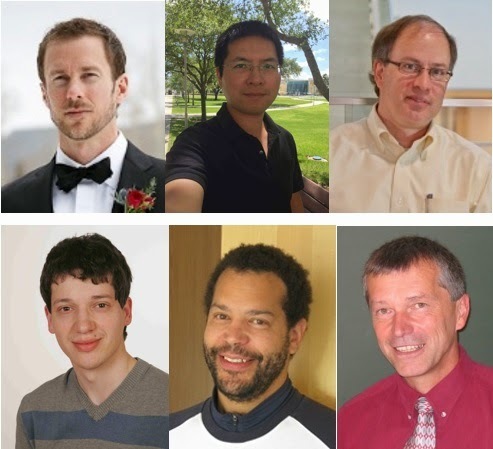 R. P. Smith, J. K. Wahlstrand, A. C. Funk, R. P. Mirin, S. T. Cundiff, J. T. Steiner, M. Schafer, M. Kira, S. W. Koch, "Extraction of many-body configurations from nonlinear absorption in semiconductor quantum wells". Physical Review Letters, 104, 247401 (2010). Abstract. R. Huber, F. Tauser, A. Brodschelm, M. Bichler, G. Abstreiter, A. Leitenstorfer, "How many-particle interactions develop after ultrafast excitation of an electron–hole plasma". Nature, 414, 286 (2001). Abstract. Mackillo Kira, Stephan W. Koch, "Semiconductor quantum optics" (Cambridge University Press, 2011). M. Kira and S.W. Koch, "Quantum-optical spectroscopy in semiconductors". Physical Review A, 73, 013813 (2006). Abstract. M. Kira, S.W. Koch, R.P. Smith, A.E. Hunter, S. T. Cundiff, "Quantum spectroscopy with Schrödinger-cat states". Nature Physics, 7, 799 (2011). Abstract. M. Mootz, M. Kira and S.W. Koch, "Pair-excitation energetics of highly correlated many-body states", New J. Phys. 15, 093040 (2013). Full Article. David Sholl and Janice A. Steckel, "Density Functional Theory: A Practical Introduction" (Wiley, 2009).